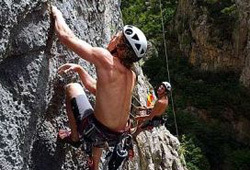 Paklenica National Park is the most important Croatian climbing centre, well-known not only in Croatia, but also abroad. In terms of the organisation and quality of its climbs, it can be included among the European elite. This climbing region is given a specific charm due to its proximity to the coast and, as such, the Paklenica Riviera is an ideal place to combine climbing and water sports. The history of climbing in Paklenica dates back to 1938 when Dragutin Brahm tried to climb Anića kuk, tragically dying in the attempt. Two years later, S. Brezovački and M. Dragman completed Brahm’s route. The second phase of climbing began in 1955 when the trickiest face of Anića kuk, Mosoraški, graded 5+ in terms of difficulty, was conquered. From 1960 to 1970, many faces were climbed, including Velebitaški, Klin, Funkcija, Karabore and Ljubljanski. Today, there are over 400 marked routes on the slopes of Paklenica, varying in length and difficulty, meaning every climber can find something to his/her taste. 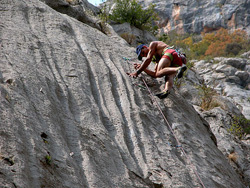 The main climbing season in Paklenica lasts from spring until late autumn. Every year, at the end of April and beginning of May, an international alpine meeting is held where competitors take part in a big wall speed climbing competition.